The Best Free Worldwide Guide to Growing Cannabis Indoors! Created By Denver Party Ride. This guide was written to be a comprehensive manual for growing high quality marijuana indoors in Colorado. The following information and product recommendations are the opinion of the author and have been proven and tested by him alone. By no means is this the end all and be all of growing cannabis as there are many other techniques that have proven results. However, this guide will help you to both successfully grow great looking plants as well as drastically keeping costs down. All experience by the author was done within the bounds of the law within the great state of Colorado and this guide is for those residing in this state. There is a ton of information on growing marijuana freely available to anyone with a computer and the internet these days. It seems like everyone has a different way of growing indoors. It can be very difficult for the newbie to differentiate what is necessary for a successful grow and what isn’t. This guide should show you a very easy and cheap way to get just as much yield as anyone else spending a fortune. The popular shopping website, Amazon.com, has proven to the author to be an amazing resource for finding what is needed for very cheap and also very quickly. Often times they are much cheaper than grow stores and other online outlets. Use Amazon effectively and you will save hundreds if not thousands on essential grow supplies. This guide focuses on growing indoors with soil, not with hydroponics or outdoors. These other types of growing methods will be discussed in a separate guide at a future date. The important thing to remember if you get nothing else from this guide is that growing marijuana isn’t rocket science. Even if you do a bad job, you will at least come away with an ounce or two of your very own home grown weed. It’s a very rewarding hobby to get into and should be a lot of fun if you follow the recommendations of the author. Pay attention now cause here we go! Okay, the first step in your quest to grow marijuana is to find a proper grow space. The author currently grows plants in an area 5’ by 10’. It is a closeted area located right next to the crawl space of the house which allows for proper ventilation. What you are looking for in a grow space is an area that is locked away from children, pets, and other unwanted intruders. It’s actually the law in Colorado to grow in a secured environment, so make sure to put a lock on the door into your grow room should that be your route. The next best solution for complete security and to prevent unwanted smells from nosy neighbors is to purchase a grow tent. You can get big or small tents depending on your grow needs and they can be placed near windows or other areas with good ventilation. They are usually a couple hundred dollars but can be used over and over for subsequent grows. The best part is that locking them isn’t a problem, you just lock the zipper so nobody can gain access. They really keep everything contained in one location as well. Grow tents can also be placed out in the open in your home without being an eye sore. The larger dispensaries have grow warehouses filled with hundreds of plants but you don’t need to start there! Should you not go the grow tent route and you already have a suitable growing area, then this space should be as big as you can possibly make it. In the state of Colorado, 6 plants can be grown at once for most people unless you have extenuating medical circumstances. This means that 3 can be flowering at one time. An area 3’ by 3’ is just about the smallest area you could have and still flower 3 plants. If you have a medical license then you could be growing up to about 100 plants for edibles, hashes, and other concentrates. 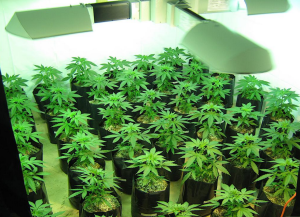 This type of a grow operation usually requires more than one person to manage and can be very costly. Hopefully you as the reader can adapt the techniques in this guide to maintain the number of plants you plan on growing for your needs. When evaluating a grow area, it is also important to make sure you can properly clean and ventilate the area. For the cleaning part, it’s always good to use a pressure washer on the floors and walls if possible. Also, If you follow the recommendations of this guide, you will be using lights that emit a lot of heat. A properly ventilated grow room will help you avoid cooking your crop. It will also make sure that the plants are receiving fresh air at all times. What they are going to do is take in carbon dioxide and release oxygen. If there isn’t a lot of air exchange, then the plants essentially can’t breathe properly. The room becomes way more saturated with oxygen and not enough carbon dioxide and things get out of whack. This can lead to lower yields and unhealthy plants. Proper ventilation is also important to get the marijuana smell out of the house. It is pungent and it will permeate the whole home unless you take the necessary steps to prevent this from occurring. They sell charcoal filters of varying sizes that essentially eliminate any smell whatsoever. They are a life saver if you desire to keep your grow on the down low. They are also needed to prevent greedy people from figuring out that you have thousands of dollars of high grade marijuana growing in your house. People will recognize your grow as a source of income and it’s very necessary to protect it from these types. 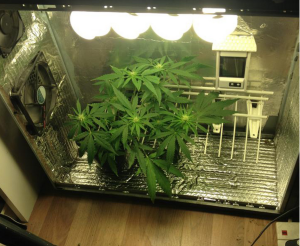 With that being said, if you can find a grow space that is near a window, crawl space, or some other area where you can use a fan or fans to route old air out and bring fresh air in then that would be perfect. It is also important that the floor of your grow room be some sort of material that you won’t mind getting wet. No matter how hard you try, you are going to be constantly spilling water and dirt on the floor and this can become a problem if it’s a carpeted area. 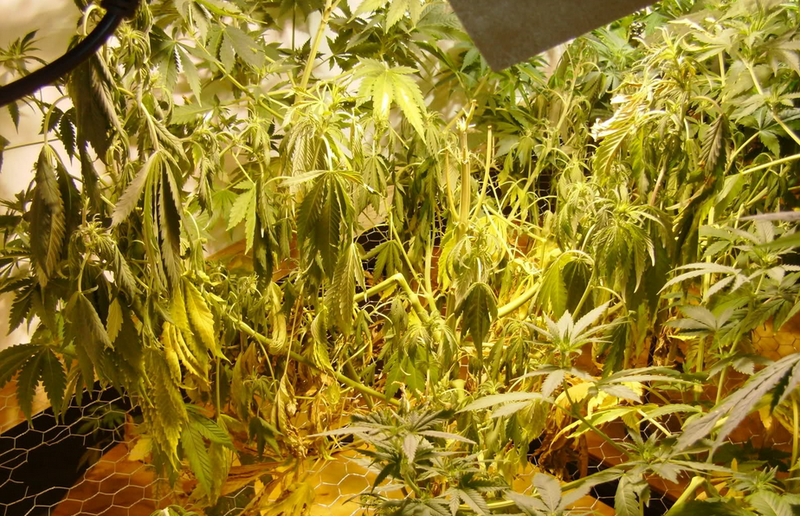 While this type of grow room is not ideal, you can still grow effectively, but be as careful as you can with spills. One of the solutions to this water and dirt all over your floor problem is to purchase plastic tarps. These are a life saver to grow weed easy by keeping things contained. You can cut them to virtually any length or size of your grow room. It is ideal to cut the tarp into a piece a little bigger than the actual size of your grow room so that you can create somewhat of a basin to keep things contained. If you have a little extra money though, go ahead and purchase a grow tent because these keep everything contained naturally in one secure area. If for some reason the tarp or grow tent idea won’t work then they sell these grow trays as well that keep things cleaner. Another factor is finding an area with a lot of height in the room. If you follow the recommendations of this guide, then you can expect your plants to grow anywhere from 4-6 feet tall when they are just about ready to harvest. Make sure you are going to have room. If you don’t have a tall area, then this is okay as well. More information on how to stunt your plants growth will be explained later on in the guide. Time is also a factor for the grow room. Based on your growing technique, to take plants to maturity could take anywhere from 2.5 months to 5 months. Make sure you aren’t going to be needing the space you are using to grow for any other application. Alright, so you’ve read the preceding paragraphs and maybe you live in an apartment or just don’t have any suitable place to grow marijuana. Don’t worry, not all is lost. There are various techniques for growing that will work with just a closet, a garage, or an attic even in the winter months. If you wanted to grow just one plant, then an area 1.5’ by 1.5’ would work just fine. As stated earlier, the plants can sometimes get pretty tall but if you don’t have an area that allows you to keep a 6’ plant, there are other ways to grow indoors. Keep reading because it will be explained later on how to deal with the “Not So Ideal” grow spaces. Whatever you do, don’t give up hope. 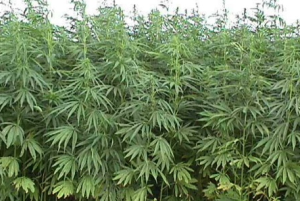 The author has found that almost any environment can be used to grow high quality marijuana. The bigger the better if you can. 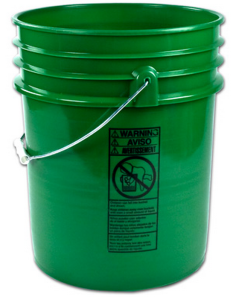 In the authors’ opinion, nothing less than 5 gallon pots should be used long term. 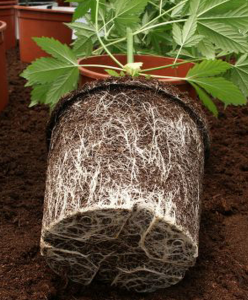 The roots of a marijuana plant expand very rapidly and you want them to have as much room to grow as possible. The author has found that in every case, a smaller pot leads to smaller yields. They sell rubbermaid tubs on Amazon.com that make great growing pots because the roots can expand to their true potential. 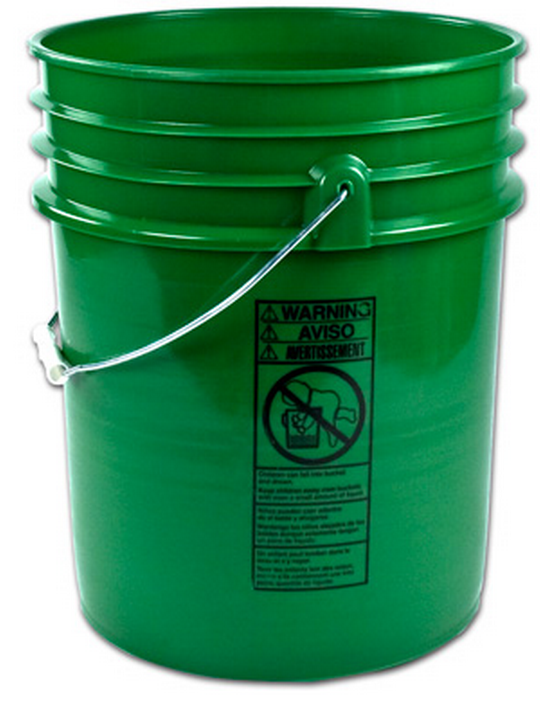 Another solution is to buy buckets that you can get in bulk here. Just drill a few holes in the bottom and they work just as good as pots. Aside from this, one of the easiest ways to get great results for your marijuana grow is to purchase grow bags. These are super easy to maintain and they allow the roots to really breathe resulting in stunning grows and even better yields. These bags can also be bought in bulk and are worth every penny. Get yourself a tray to collect water runoff or a tarp, and you should be all set. The also sell very cheap plastic trays that slide underneath the 2 gallon to 5 gallon pots and can be found online for around a dollar each. Just about any plate, or Tupperware can be used to collect the water run off as well. So if you have read this entire paragraph and for some reason you just can’t find a 5 gallon bucket then again, not all is lost. Techniques will be explained further along in this guide to show you how to grow marijuana with a smaller pot. This is a section that could be very long in a different growing manual. The author believes that every newbie should start out growing in soil. You could gradually gain more experience growing hydroponically but this is more complex and prone to human error. Hydroponic growing requires no soil, only nutrients and water. These are mixed together in the right amounts at the right time to feed the plant. The author has seen no evidence that either growing method produces any more yield than the other. Stick with soil for now and you will easily grow great yields with less effort and less cost than it would take hydroponically. Soil is key, absolutely key. 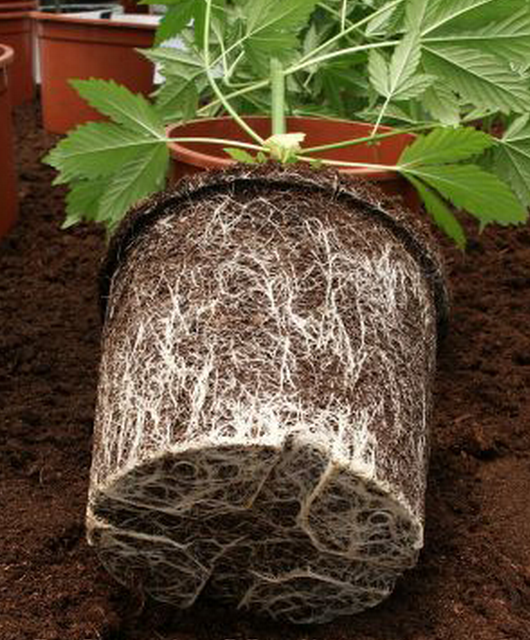 If there is one aspect of growing marijuana that you shouldn’t screw up, then it’s the soil. Don’t just use dirt from the backyard or any old soil from the hardware store either unless you have to. Marijuana soil should contain all the essential nutrients that this specific plant needs to grow. Picking good soil can also save you money because you’re picking dirt that has already been infused with desirable vitamins and minerals. This means you don’t have to buy expensive nutrients until later on. 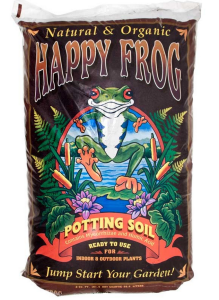 With that being said, the author uses Happy Frog soil almost exclusively to grow weed easy. It contains the right amount of ingredients to get the plants a solid start. He feels that if it isn’t broken, don’t fix it. 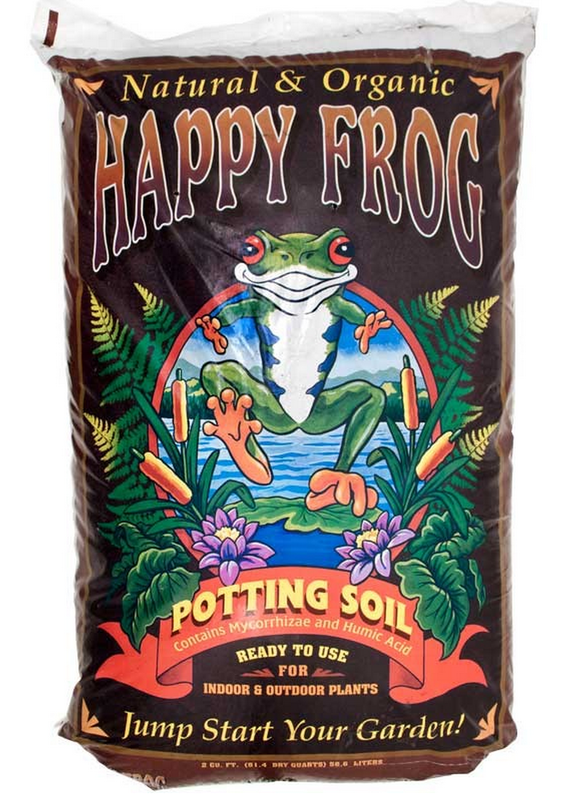 Happy Frog soil is by no means the end all be all of soils but happens to be what the author started out on and hasn’t changed since day one of growing. There are many soils which would be perfect but don’t pay too much for them. Also stay away from used dirt because the nutrients have been depleted already. Again, soil is key. Make sure to start your plants out right. The author has found that the temperature isn’t super important to the growth or yield of marijuana plants as long as it is kept between 60 and 80 degrees. He accomplishes this with the means of a portable heater in the winter time and strategic fans in the summer. 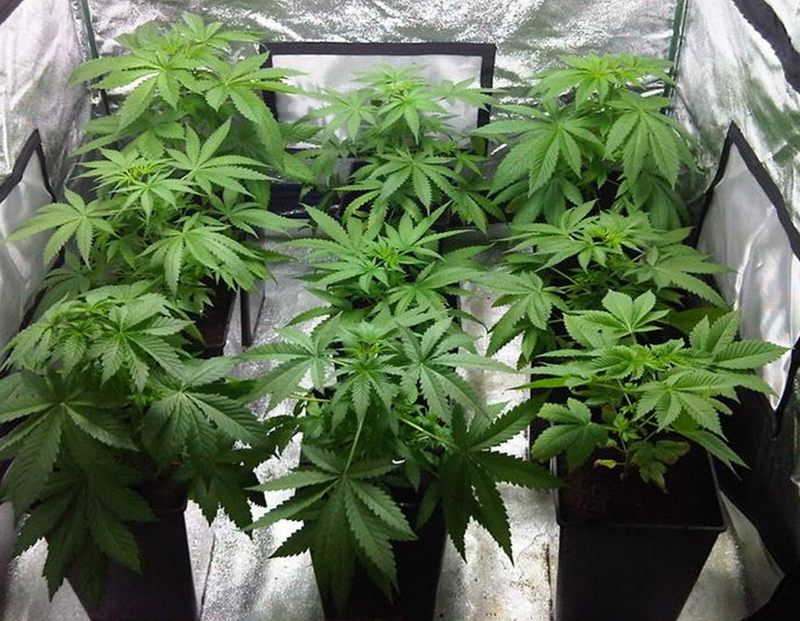 If your grow area is very small and you are using high powered lights then an air conditioning unit is recommended. These can be a life saver if your grow room gets too hot and you’ve tried everything else. As long as you have a proper ventilation plan, you can purchase these portable AC units and keep the temperature in line. Growing indoors makes it a lot easier to keep the temperatures steady. Marijuana grows at around the same temperature that most people maintain their houses at. Also, don’t worry if you are growing indoors in the winter time and your grow room gets cold. You can easily go pick up that little electric heater from Amazon with an adjustable thermostat so that you don’t have to mess with it. Just set it to 65 degrees for instance and leave it be. Also, be aware that when you are flowering your plants, your lights will be on for 12 hours and off for 12 hours. When the lights are on, the grow room will heat up, and when the lights are off, it will get much colder. Be aware of this and make sure you adjust for these changes in temperature. Usually, experienced growers leave the lights off for 12 hours during the day and turn them on during the night. This really helps to reduce the heat buildup in your grow space. Timers will be needed for keeping a consistent lights on/lights off cycle. These aren’t too expensive and should be purchased unless you decide to turn the lights on and off at the same time every day. You need to make it consistent though because the marijuana plants are very sensitive to light and adjust better to a set schedule opposed to a random light cycle. Serious problems occur when you mess with light schedules or turn the lights on during the 12 hour off cycle. More about this later but let’s continue. Wow, lights are a definite essential for growing just about any living plant. Marijuana is no different. Plants need the sun to grow and since you will be growing indoors, you will need to recreate the sun inside your grow room. Lights with the most wattage are best. There are a wide variety of different options but the author recommends using High Pressure Sodium lights, or HPS. This has been the cheapest and best light to use depending on where you will be growing. They work best if you have a well ventilated room though. A lot of people will tell you to go with LED lights but these types of lights are generally more expensive. However, they are another option to get the job done and reduce your electricity bill by a lot. They also do not emit half the amount of heat that the HPS lights do. If you don’t have a ton of ventilation options, then you should at least check out the LEDs and see if they are for you. 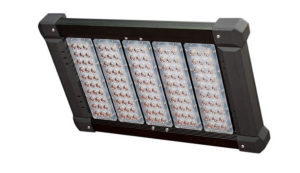 The reason the author uses HPS lights is because we’re trying to cut down on growing costs in this guide. There are other options for lighting as well as those mentioned here but for the most part, they are more expensive and the author just sticks with what he knows. Not a lot of detail will be given in this guide about lumens, or other technical knowledge about these grow light options. All you need to know is that the more wattage the light has, the better. The author is a big fan of 1000W HPS lighting fixtures. Under one of these lights you could grow between 4-6 plants and get somewhere in the range of 12-15 oz yield after 3 months of growing. A 1000W HPS complete setup can be found on Amazon for roughly 200 dollars. Very inexpensive and this includes the ballast as well as the hood. Some packages even contain the necessary bulbs. If you are serious about ventilation then you can get something like a cool tube. You will need an inline fan as well if you go this route but it’s recommended by the author. The cool tubes pull stale air and heat from the bulb out of the grow room very efficiently. Be aware that your electrical bill will go up once you start keeping your lights on for 24 hours a day but the benefits of having your own crop outweigh this expense. If you’ve been doing any research into growing marijuana besides this guide then no doubt you have found information about metal halide lights as well. It’s strongly recommended to uses metal halide lighting while keeping the lights on for 24 hours a day. This is only done while your clones or seedlings are in the veg cycle. There is a different spectrum that growing, but not budding, plants enjoy. This isn’t to say that you can’t use your normal HPS bulbs but it is indeed recommended to use metal halide during this first stage of growth. If you are lucky, you can find a lighting setup that can be used with a metal halide bulb as well as an HPS bulb. With the flip of a switch and a change in the bulb, you can use both. These types of setups are getting popular and can be attained rather cheaply. More about the vegging cycle later on in this guide. Don’t worry too much about the type of bulb you buy either. The author has found that any horticulture bulb works. If your lighting setup doesn’t come with a bulb then a 1000W HPS bulb, brand new, can be found on Amazon for roughly $35 including shipping. Be careful of buying so called “New Bulbs” on Craigslist.org as you can’t tell if they are really new. It’s not much more expensive to just order a new one online and you will be assured that your bulb has a lot of life left in it. In general, one bulb will last you two grow cycles or about 6 months of use. It’s a good deal for the money. As far as how far away from your plants you want the lights to be, you should keep them as close to the tops of your plants as you can without burning them. The farther away your lights are, the more lumens you are losing. This lost light could be used to help the plants grow. The way to tell if you are close enough is to place your hand about the same distance from the light as your plants are. If it’s too hot to keep your hand there for 30 seconds, then raise the lights. You want to maximize the light energy but not burn the plant. In the common problems section, you will be instructed on how to recognize light burn on your plants. If you can’t get your hands on a 1000W HPS, then you can also get a 400 or 600 watt light fixture and these will also be sufficient. Don’t expect the same yield as you would get with a bigger wattage light though. 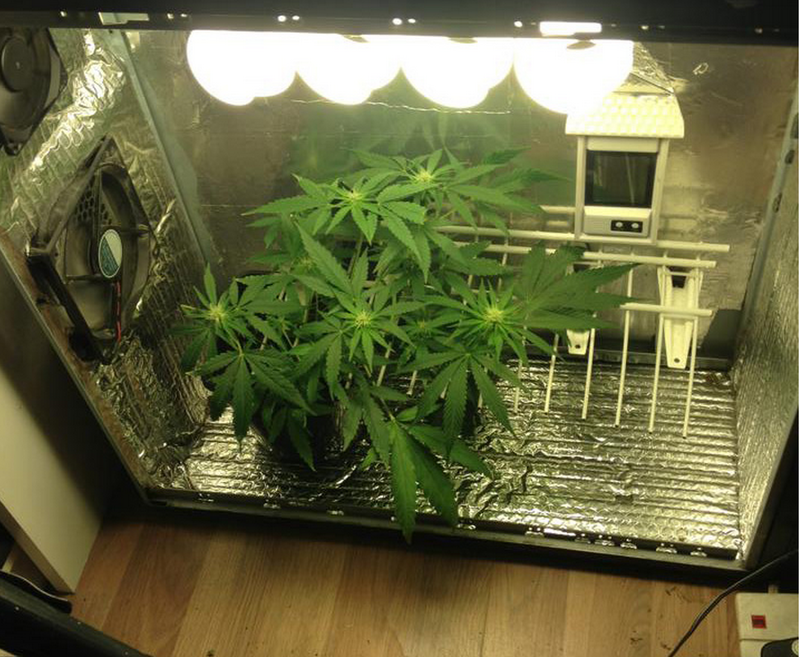 Two to three plants would grow fine under smaller HPS light fixtures. There are also other very expensive light fixtures and bulbs that can get the job done. Not necessarily better than any ordinary HPS fixture but will reduce electricity costs and are more efficient. People have been growing marijuana with HPS for decades now though and have consistently seen large yields. Don’t get sold something that you really don’t need. Aside from HPS, Metal Halide, and LED’s, the author doesn’t have any further recommendations. Again, he has found a very effective lighting system and if it isn’t broken, then don’t fix it. The author uses regular Colorado tap water and has never had any ill effects. He makes sure that the water has a PH of between 6.0 and 6.5 but hasn’t spent the money on a filtration system. If you really want to use filtered water, then that would be ideal but be prepared to purchase some sort of RO/DI system or pre-filtered water which can get expensive. The most important aspect of the water you use is that it be within the optimum PH range for your plants. If it is not within the 6-7 range then your plants will suffer. They won’t be able to uptake any of the special nutrients you are going to be giving them. There are many affordable PH kits that you can use to both test and modify your water so that it is within the appropriate range. Any grow shop will be able to point you in the right direction but don’t pay more than $10-$15. Another useful device to make sure your water or tap water is okay for growing is a dissolved solvent meter. This great product will tell you how many dissolved solids there are in the water you are using to feed your plants. You will be adding nutrients to the water as well and you don’t want to over feed your plants. This leads to leaf burn and other problems such as lower yields and toxic soil. A tip of advice is to test the water after you have added the nutrients. This ensures that you get an accurate reading of what you will actually be feeding your plants. Ventilation is important. You should have at least one fan in your grow room to provide circulation to your plants. You want them to sway gently in the wind. This makes sure that the oxygen they are releasing is blown away with fresh air and there is enough CO2 to absorb. The author uses a fan that rotates so that it blows evenly over the crop. The second reason to have good ventilation is because of heat. 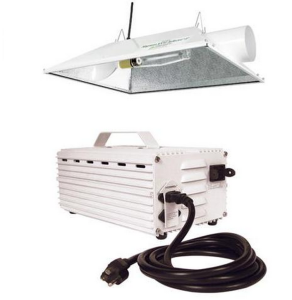 If you are using the author’s recommended 1000W HPS light, then you will have heat that probably will need to be removed from the grow room to avoid overheating. Different kinds of fans are used for this purpose. They are called inline fans and once again, can be found rather inexpensively on Amazon.com. 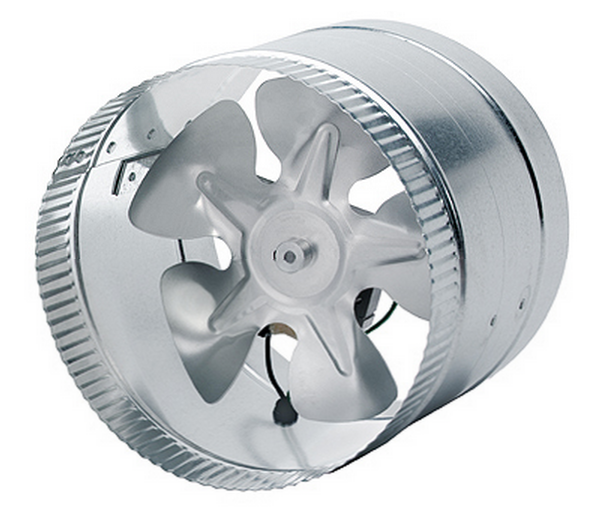 Ideally, you will need 2 inline fans in your grow room. One to bring fresh air into the room and one to route the old, hot air out. This can be achieved with ducting you can find online for cheap. Just be sure to match up the inline fan sizes with the ducting. Popular fan and ducting combinations are 4”, 6” and 8”. The 8” combo is obviously better because it allows more airflow but if you don’t have a huge grow then it shouldn’t be a problem to use smaller sizes. Watering is important. 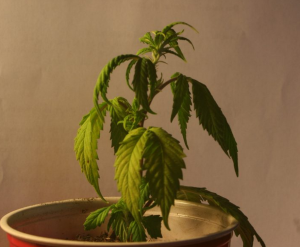 Assuming you start with some sort of marijuana clone or seedling, once it is transplanted into a mother pot, watering should be done with care. At first, make sure you don’t overwater. Get yourself a watering can here and carefully get the surface of the dirt completely wet. At this point you actually don’t even need a watering can, you could use a cup if you wanted. Later on though you will want to have a watering can that will be easy to reach plants in the far corners of your grow space. It’s worth it to spend a little more on a can with a long spout. One thing to realize is that when you are using nutrients in your water, you never want to expose fan leaves or buds to these chemicals. You want to only apply them directly to the dirt and roots. If you splash nutrients on these fan leaves then you will destroy them. They will burn within a few hours and will need to be removed. You want a watering can that will allow you to easily reach the root area without splashing or hitting these important leaves. You should be putting enough water in the soil so that you can see just a little exit as water runoff as well. As your plants grow, be aware that you will be using more and more water. Eventually you are going to be dumping water into your potted plants because the root structure has gotten so large. The more water you can use without over watering them the better. It’s definitely a delicate balance but you will get the hang of this. The author has never had a plant die because of overwatering but has seen some plants’ leaves droop as a result of too much. Scroll down to the common problems section for more info on what it looks like if you are over watering your plants. You don’t want them sitting in water all the time either. This leads to root rot and bug problems, maybe even mold at times. It is recommended to not leave standing water in the water runoff trays for very long. Ideally, you will be watering your plants about every few days depending on how they look. It’s always better to under water your plants versus over watering them. If the first two inches of soil are dry, then you probably are ready to water them again. When you start to flower your crop, and the root system is very elaborate, they are going to soak up water like you won’t believe. This is perfect! Give it to them. Water is one of the most essential elements of growing marijuana. Under watering leads to smaller yields and less healthy plants that don’t grow as fast. You want to be as efficient as possible, so don’t be stingy on the watering. If you have any further questions about how much or how little to water, you can always get a water meter that takes the guesswork out of this process. Just place it in the dirt and see how dry it is! A plant that is properly dosed with nutrients will be a healthy plant. 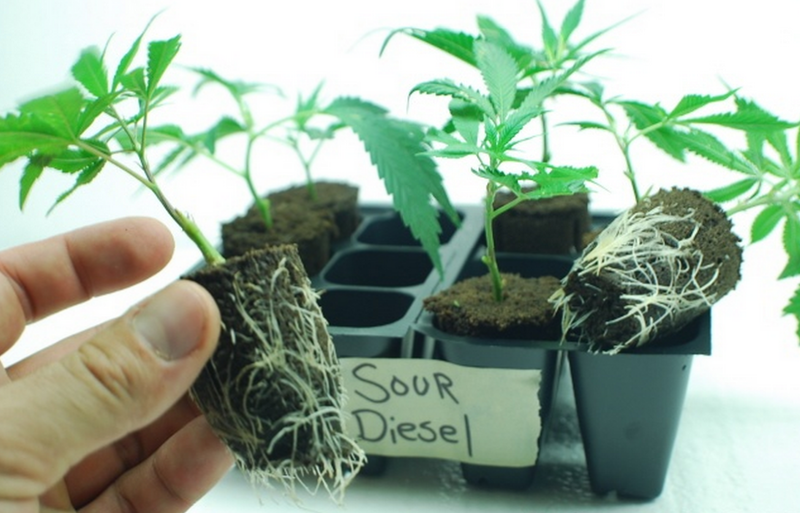 Different nutrients will need to be used during the different stages of marijuana plants growing. During the vegging stage, you do not need to use anything special for the first few weeks, especially if you have bought some soil like Happy Frog or the equivalent competitor’s soil. These mediums are already infused with all the nutrients you need for the vegging plant. After the first few weeks, go to your local grow store or shop online and get yourself a “Vegging” nutrient supplement. Don’t go out and buy 10 different types of nutrients though. All you need is one supplement for vegging and a different one for flowering plants. Make sure you are purchasing from a reputable brand though as this will prevent you from getting unnecessary nutrient burn on your plants. After you purchase your preferred nutrient supplements, make sure to use about half of what is recommended on the bottle. These plants need nutrients but not too much. Almost every nutrient company out there over states the amount of nutrients that the plant actually needs. Use half the recommended dosage for optimum results for your marijuana grow. Marijuana is a weed and will grow in virtually any type of medium with just about any dirt and nutrient combination. Be cautious and don’t fall into the expensive and unnecessary practice of inundating your plants with nutrients they don’t need. A great strategy is to use just one particular nutrient line such as Fox Farm. Again, they can be found in virtually any grow store as well but Amazon typically has them for cheaper. The smell of your grow could be of either great concern to you or not a concern at all depending on your living situation. 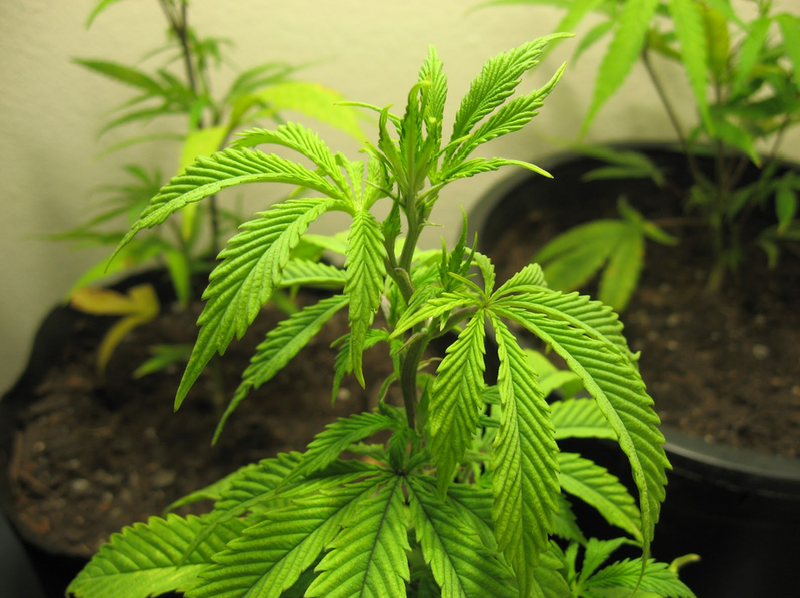 Marijuana plants do smell though and even one or two plants can potentially stink up your house. The marijuana clones smell, the vegging plants smell, and the plants with huge buds on them smell. There is no way that you can avoid an odor when you are growing cannabis. The only thing you can do is either mask the smell or use proper ventilation and ducting which will take the air from your grow room directly outside. Certain strains smell stronger than others but as a general rule, expect the growing marijuana to smell and either prepare for it or maybe it just isn’t a big deal to you. If you do have a problem with the smell though, then purchase a carbon filter. There are many different types of carbon filters on the market today. You are going to have to evaluate your growing area and the fans you are using and purchase one or two based on your needs. You can purchase carbon filters, or sacks of carbon from any grow store, Walmart, or online. If you don’t have enough money for a carbon filter, place a bag of carbon behind an exit fan so that it pulls the smelly air through the filter and then outside. This will completely kill the smell or at least make it manageable. Chapter 2 Overview: Find a location to grow your marijuana, the right size pot, good soil with nutrients, the right lighting, ventilation and WATER WATER WATER. Okay, now you’ve gotten to the cool part! You have things pretty well set up in your grow room and now you need some plants. You have basically two options here in Colorado, or anywhere for that matter. 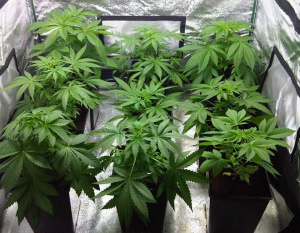 You are now faced with the decision of either growing your cannabis plants from seed or from clone. You want to grow weed easy and both of these options have advantages and disadvantages which will be discussed below. The author has lots of experience with both methods but as a rule, when growing marijuana, you always want to have female plants. Cannabis is not much different than other plants in that there are males and females. 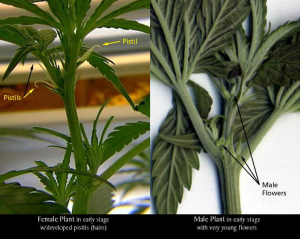 The female plant produces the buds that you smoke. The male plant does not produce these buds. Instead they produce pollen which, in the wild, will be released into the air to make contact with the buds of a female plant. This causes fertilization of the female and the subsequent result of this process are seeds. You don’t want seeds in your bud. This is embarrassing and should be avoided at all costs. There are some growers that are trying to perfect strains and produce seeds. They use these seeds for future grows or to sell but for the purposes of this guide, you don’t want seeds. 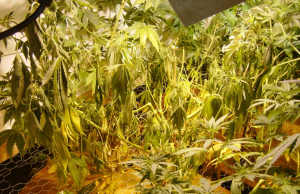 If you find a male plant in your grow room, then remove it immediately. 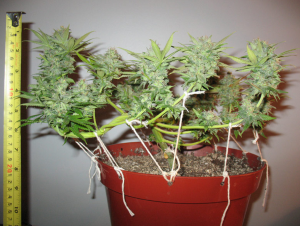 The advantages and disadvantages of using marijuana seeds are as follows. Seeds are great in that you get a fresh start on the plants life. You are in control of the entire process. For example, when you purchase clones, you are taking a cutting from someone else’s grow room and putting it into yours. It’s often tough to look at a clone and determine that it is pest and disease free at first. These types of hidden problems show up later on when it’s too late and your entire grow is infected. You have no idea how clean the seller of the clones grow room is or what precautions they have in place to avoid selling you contaminated clones. With seeds, you don’t need to worry about this as everything is taking place under your watchful eye and care. One of the downfalls with seeds though is that the whole process takes longer from planting to harvesting. A seed takes about a month from germination to become the size of a clone. So basically, if you were to start with a clone, you would be saving yourself a month’s time that you would have spent growing a seedling. If you have the time then by all means, use seeds but if time is of the essence, then maybe you could cut off a month of grow time by using clones. There are three different types of seeds that you can purchase. The first being feminized seeds, the second being regular seeds, and the third being auto flower seeds. Feminized seeds are great because they have been specifically bred to produce only female plants. They are usually a little bit more in price than the others but for the most part, you will get all females opposed to the other options. This is advantageous because you don’t want to allocate a bunch of time to growing male cannabis plants. This is a waste of money and especially time. You will learn more about this later on in this guide but you will only be able to tell if your plants are male or female during the flowering cycle of the plant. This flowering cycle comes after about 2 months of growth. Imagine if you planted 12 seeds, cared for them, watered them, spent money on electricity for the lights, and more, only to find out that 6 of the original 12 are male. You wanted 12 plants but now you are stuck with only 6 and you can’t do anything about it. Make sense? The downfall to feminized seeds is that they are a little more finicky than the other seed types. Some of them may even grow into male cannabis plants although they are feminized. It just happens occasionally. It’s a small percentage of feminized seeds that do this but you should be aware of this before purchasing your seeds. Also, because they are more delicate than the other seed types, it’s possible that some of your plants grown from feminized seeds could turn into hermaphrodites. This means that the plant is stressed out and is trying to self-pollinate itself. It starts to take on the attributes of a male/female plant and releases pollen onto itself, which again, creates seeds. This unfortunate occurrence doesn’t happen all the time but it does occasionally cause you to have to discard a plant that has been otherwise great. It has been the authors experience that feminized seeds that are grown into plants should be checked more carefully for signs of stress or self-pollinating. The second type of seeds that you can purchase are known as regular seeds. These types of seeds are the hardiest of the three types and can be purchased for relatively cheap compared to feminized or auto flower seeds. If you are going to purchase regular seeds, then be aware that perhaps 50% of your plants will grow into male plants and will need to be removed from your grow room before they release pollen. This is the only downfall for regular seeds. As stated earlier, you won’t know if your plants are male or female until the flowering cycle, or roughly 2 months or longer into the grow. In the author’s experience using regular seeds, it is recommended to plant about double the amount that you are actually going to need. The reason for this is to make sure that you are left with roughly the amount of female plants you initially intended to have. The third type of seeds you can purchase online or in a dispensary are auto flower seeds. The vegetative and flowering cycle of the marijuana plant hasn’t been explained in much detail yet but with feminized and regular seeds, you initially keep the lights on the plants for 18-24 hours a day. You do this until they are big enough to be put into a 12 on 12 off cycle used for flowering. With auto flower seeds, the plants will start to flower on their own. There is no need to buy timers or adjust the light cycle for the different stages of growth. Auto flower plants tend to be smaller than their counterparts but it has been the author’s experience that the yields are quite similar. More information below about how to germinate weed seeds right. So, with the three options for seeds, be sure to weigh the pros and cons of each of these routes. Also, weigh these options against just purchasing clones from a dispensary. When you choose to purchase clones, or baby marijuana plants, make sure that the clone you buy was taken from a female plant. This will ensure that you only grow female plants. If you grow a male plant for a month before realizing it’s a male then you have wasted valuable time and resources on a worthless plant for yield purposes. Clones from female plants will always be female and a good way to get started. Another reason to start with clones is that someone else has already done the cannabis cloning part for you. They have made the cannabis cutting, cared for it for at least two weeks or more, put it into a small cup with dirt and allowed it to root. All that takes effort that you probably don’t have time for. The author has found success buying most clones for between 10-15 dollars at clone dispensaries. The kind of buying and selling of clones on Craigslist is a very gray area as far as how legal it is. Just be aware of the laws in your area. Sometimes, with a little research, you can also find dispensaries running specials and you may be able to get a great deal. Going to the store is also a safer way to make sure that the strain you purchased is actually the strain they say it is. Make sure to check the root system of the clone and be positive that it is free of any parasites or diseases. This last sentence is pretty important. Once you get parasites or diseases into your grow room then it’s often times an all-out war trying to get rid of them. The author has had to discard entire plants and grows as a result of pests and diseases like mites and powdery mildew. Be absolutely sure that the baby plants you are purchasing are clean. If possible, check out the area where they were grown and look for anything out of the ordinary. Better to be safe rather than sorry. The leaves of your clones should be green and not droopy. Be aware that a common practice for commercial cloners is to cut the fan leaves of the clone in half to save room in the tray, so this is normal to see these cuts. The clones should stand up on their own and show signs of growth too. Don’t worry if some of the leaves are drooping because of overwatering or have burn marks on them. Just make sure that the plant otherwise looks healthy. The author has never had a clone die on him and you shouldn’t either if you follow this guide. When the author gets a clone, the first thing he does is transplant it into a larger pot or bucket. They usually come in small cups or containers that aren’t suitable for the plant to continue to grow in. The transplanting process is pretty straightforward and easy. Just get your 5 gallon bucket, or whatever you are using to grow the clone, and fill it halfway with dirt. Turn the baby plant upside down while holding its base with your fingers. Make sure to gently squeeze the small clone pot and dislodge the clone, roots, and dirt from its cup and place it on top of the halfway filled pot. Place dirt around the clone until you have completely buried the initial dirt and root system. After this, water the baby plant right away but be careful not to overwater as the plant hasn’t had a chance to grow its roots out into the new dirt yet. Overwatering is common at this stage. Be sure to check out the common problems section to see what overwatering looks like. That’s about all there is to transplanting and caring for baby marijuana plants. Place it under the light you purchased and keep it on for 18-24 hours a day. This is what is called the vegging cycle and will be explained in more detail in the “Vegging Section” of this guide. Okay, so now your clones or seeds have grown a little bit and have been put into their final pot. You are now ready to veg your plants. This is pretty easy once you get the hang of it. This is the time when your lights are going to be on the plants for 18-24 hours a day. A lot of growers will tell you that the plants need 18 hours of light and 6 hours of darkness but this hasn’t been the author’s experience. The plants do not need a dark time and can use the 6 more hours per day of great light to grow under. It’s your choice though and there are arguments either way. Since the author has had better luck with a 24 hour light cycle during vegging, the rest of this guide will focus on vegging with the lights on all the time. During this vegging state, you are just monitoring and feeding the plant nutrients. The hard work has been done. Keep watering your plants and check for any developing problems. Be sure not to over water though. More water does not necessarily mean more growth. In fact, the opposite is true. The author waters his plants according to root growth. At first you will probably want to water them every 3 or 4 days as the roots are just beginning to expand into the pot you put them in. After a month or so, the roots will be larger and require more frequent waterings, like every other day. The soil will tell you when you need to water though. Pay attention to it. If it looks pretty dry then pick up the pot and feel how light it is. A container with enough water in it will be heavy to the touch. If your pot feels lighter than it normally is and the top 2 inches of soil are bone dry, then give it some water. When you do need to water, give it quite a bit. By now you should have purchased your water runoff trays. Make sure that the water you give the plant permeates the entire pot and leaks out the bottom into the tray. Once it starts to leak out the bottom then stop watering that plant for the day as it’s gotten enough. Pay attention to the leaves of your plant too and check out the under watering and overwatering section below in this guide. You will develop a keen sense of this as you continue to grow your plant. It’s an art that is very easy to master. As far as nutrients are concerned in the vegging cycle, they are necessary. Purchase a good organic vegging cycle formula that you will add to the water about every 3 or 4 waterings. You don’t want to overdo it at all. So water twice without nutrients and then add them at half strength for the next watering and then go back to just plain water, etc. Since you are growing in soil, a lot of the nutrients are already in the grow medium. No need to use nutrients at full strength ever when using dirt. Too many nutrients will lead to nutrient burn which should be avoided at all costs. Again, let the plant tell you what it needs. Anything but beautiful and big light green fan leaves and you know you have an issue. During the veg cycle, you should start to develop great looking plants that will eventually provide you with a huge yield. There are a number of options here in this cycle for how long to keep your plant in this stage. I will give you two growing scenarios and you can hopefully gauge how long you will veg them by these examples. You are growing a few plants and have all the time and space in the world to work with. It would be the author’s recommendation to veg the plants for as long as possible in this case. Potentially 2 months or more. Just be aware that the longer you veg your plants, the larger the root structure will get. If you plan on vegging for longer than 2 months, then a pot bigger than 5 gallons is strongly recommended. If you don’t plan for this root growth accordingly then the plant’s growth will be stunted. As a general rule, the longer you veg your plants, the larger they will be and the higher the yield will be. 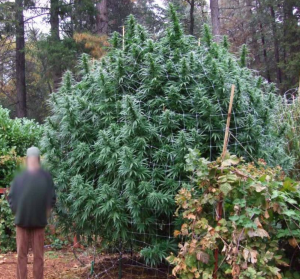 Again, if you aren’t worried about how big or tall the plant gets. You will end up with a huge plant and after 2-3 months of flowering, you could potentially get a pound or more of yield. Compare that to a few ounces from a plant that has been vegged for a month or so. In general, the standard vegging time frames are from 1 to 1.5 months under normal circumstances. If you stick around that number, you will be successful. The author knows of a grower who uses one 1000W HPS light and one plant and after 2-3 months of vegging and two months of flowering, he can get over 1 pound from each plant. Patience is key. If you have the space, then you want to veg for as long as you can. The flowering cycle is the most exciting, yet long, portion of growing marijuana. It is in this phase that you will start to see your hard work pay off. This is also the last phase in the marijuana growing cycle. It is very similar to the vegging stage except that you will put your lights on a timer so that they are on for 12 hours on and 12 hours off. What this does is essentially trick your indoor plants into believing that summer is drawing to a close and that they better hurry and produce nice big buds for you. You want to start flowering your plants immediately after you are done with the vegging cycle. This is usually determined by size. Many new growers don’t realize this but your plants will continue to grow taller and bushier the first few weeks of the flower cycle. This is called stretching and it’s important to know this. If your grow space is small and your plant is already getting too big then plan on it growing even more during the beginning of flower. Make sure to start flowering your plant when it’s about half the size you want it to be once done. You will be able to tell that the plants have produced buds by first noticing the small white pistil hairs that start to form on the bud spots. These small, delicate masses will continue to grow and grow for about 2 months. It’s hard to ascertain when your plants will be done flowering though. It’s kind of a touchy feely thing to know when they are ready to come down. More on this in a section coming up! Water Water Water during the flowering cycle. They will probably soak up more water than you ever thought possible. Give it to them. They need it. Dose with “Flowering” nutrients according to your schedule and watch the fan leaves and look for signs of distress. Again, do NOT use the flowering nutrients at full strength either. Use about ½ the recommended dosage on the bottle. Also, just like in vegging, you won’t need to add nutrients to your waterings everytime. Usually it’s about every third watering that they will need a dosage of nutes. Be sure to monitor the plant though and make sure everything is going well. It’s better to use less nutrients opposed to more during this cycle so you don’t burn them at such an important time. You will follow these instructions until you believe you are about 2 weeks away from harvesting. 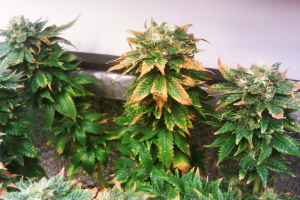 Around the 5-6 week mark you will start to notice that the fan leaves are starting to droop and turn yellow. THIS IS NORMAL. The plant is putting all of its own nutrients into the buds to make them bigger and more potent. It is also typically during flowering where things can go wrong. Watch for any plants to switch from being female to male/female as described earlier. This is not common but if the plant feels stressed out, it will panic and try to self-fertilize itself. The plant does this to self-fertilize itself which is NOT what you want. This means that your bud will have seeds in it. Plants get stressed out for a number of different reasons. 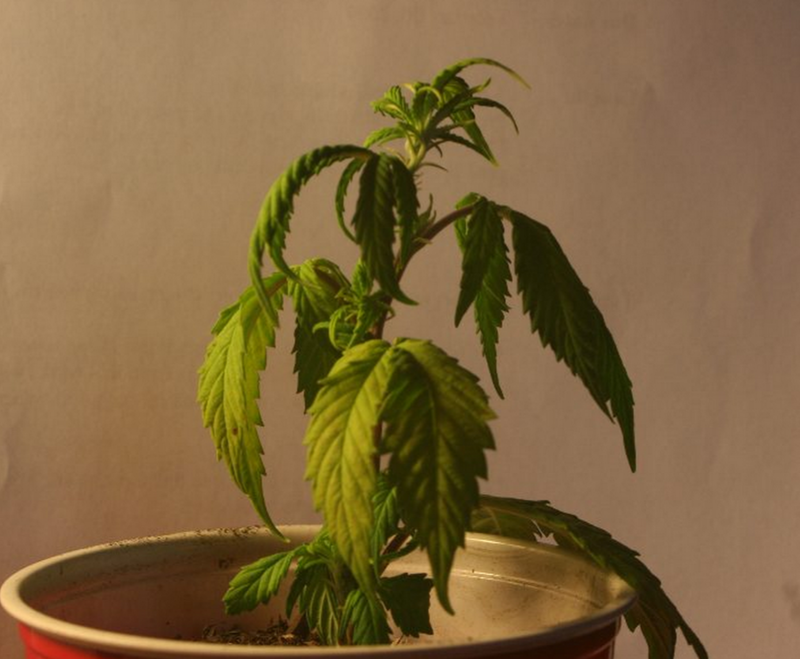 Some common reasons cited for plants self-fertilizing are that they are getting too much light during the “Lights Off” portion of flowering, lack of water, damage to the plant, trimming off fan leaves too late into flower, etc. During this flowering period, you also want to keep the same cycle going as you had when you were vegging them. 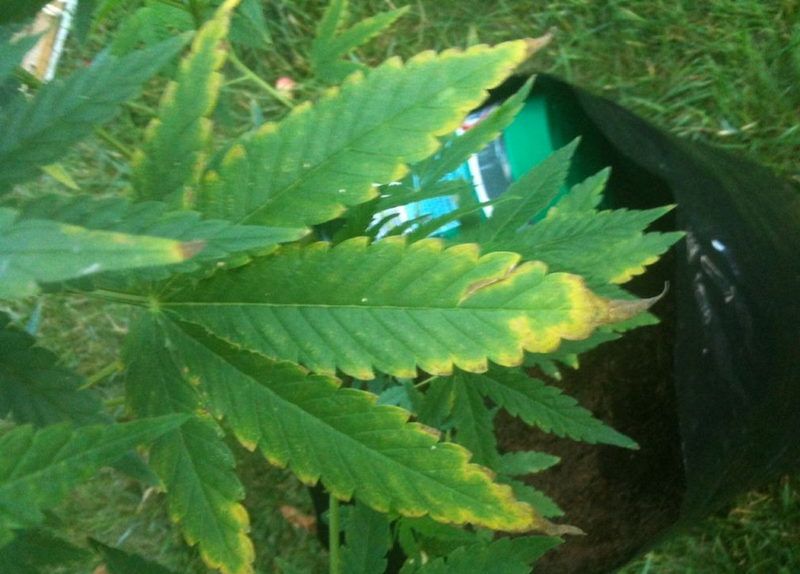 Check soil for dryness and monitor the color of the leaves and buds. Other than that, now it’s a waiting game for when the plant is done and ready to be cut down. A special section has been added to this guide called, “The Last Two Weeks” because this is the most important part of flowering your marijuana plants. A lot can go wrong during this time so it’s essential that you pour over the info in that section to minimize problems that could potentially ruin all the money and hard work that you put into growing your crops. 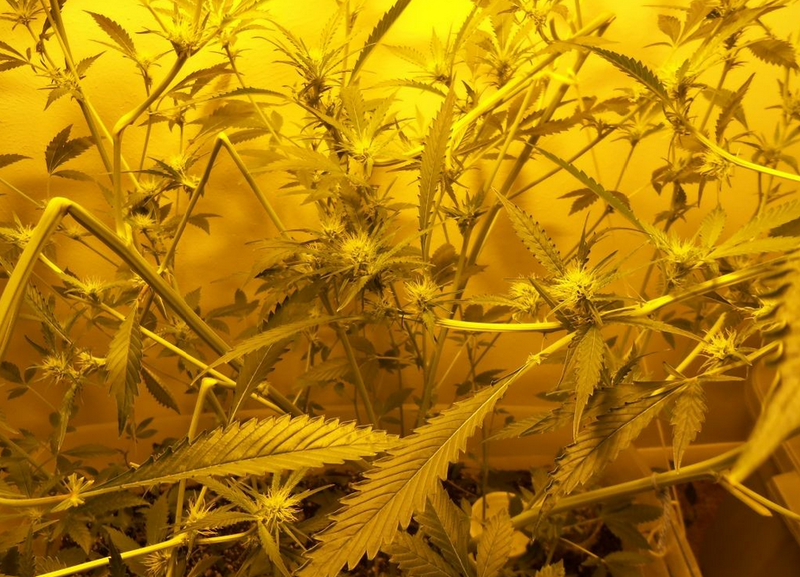 The leaves are all yellow, the buds look swollen, your grow room reeks of great smelling weed, the buds’ pistils are all brown, and you have come to the realization that you have about 2 weeks left until harvest. This is the best part about growing. The anticipation should be rising within you as you realize that you are literally days away from harvesting all those tasty buds you have been growing for so long. It is at this time that most growers start to flush their plants. Flushing the plant means that you stop using nutrients and only water the plant heavily. The idea behind flushing is to get as many of the nutrients out of the soil and plant as possible. This prevents the yield from smoking unevenly and tasting bitter. Following the flushing directions aren’t that difficult either. Keep up the watering schedule but just cease to add any type of nutrients. So, just keep watering the plants as before and keep them under the light. This might be difficult as the plants at this stage are about as tall as they are going to get. They can sometimes even get too tall and if you are doing things right, the branches will be so full of bud that they bend over under the weight. A great way to keep the flower in the light where they belong is to use chicken wire. Wrap it around the plant and keep it contained so the buds aren’t breaking branches or hitting the floor. Other than that, just be patient. One of the biggest mistakes most new growers make is to harvest too early. As you can see from the pictures, you will need to buy a 40X power magnifying glass to check on the trichomes of your plant. If you don’t know what trichomes are, they are basically the frost on the plant on thee buds. At first, this frost will be completely clear under the magnifying glass, then they will turn opaque or white. Once all the trichomes are white and some are amber looking, chop the plants down. This is perhaps the saddest yet most exciting time. You have worked so hard and checked on your plants 3 times a day for 3-4 months and now you must end their lives and harvest what you have built. With that being said, you will get over this very quickly when you see what you have grown! The next two sections can make or break your harvest. You could get a lb. per plant but if you don’t dry it and cure it correctly then your weed could easily smell and taste like alfalfa or hay. A few new purchases need to be made for the drying and curing process but trust me, it’s worth it. You will want to have them in order to produce the best smelling and tasting weed in your life. This is entirely dependent on how big you grow your plants to be. If your growing one plant in a closet, then you are probably going to veg it for a month or less and flower it for 2 months for a total of 3 months. The drying and curing is typically the same for a big or small plant and takes about a month total. So a best case scenario is that your weed is 100% ready in about 4 months. The author has seen growers veg plants for 4-5 months and flower them for 2 as well. Massive yields are possible in this case, greater than a pound per plant. But in that case from seed to smoke would take about 7 months. As a general rule, the longer you veg the plant the higher the yield will be. Manipulating your plant, when done correctly, can save you a lot of time and effort later trying to control a massive marijuana plant in your closet. Basically when controlling your plant, you are either trying to control the growth of your plant, force it to grow in a certain way, or try to make it produce more bud sites. There are various methods of doing this and they will be explained in detail below. The author has only listed the ones that he uses on a daily grow basis. Let’s say you have a small space and need to grow a small plant. Well, the marijuana plant is just going to grow up as long as you allow it to. What the author does to take advantage of a small grow space where the plant can’t get too tall is to use Low Stress Training or LST. After you have transplanted your clone into a suitable adult pot and it has been allowed to grow roots for a week or so, you are ready to bend it over and prevent it from growing too tall. You want to be careful though as once the stalk gets too thick, you cannot bend it in the shape you want any more as it will just snap. So keep that in mind when you are beginning to use LST training. What the author does is gently grab a fan leaf from the tip of the plant and gently bends the plant down and actually tapes the fan leaf to the base of the pot. You can use this method or any other way to bend the plant down as well. Some people use string and others use some heavier object to force the plant down. Don’t worry, this doesn’t hurt the plant if you do it right. What this does is essentially push the main portion of the plant down so it’s more horizontal rather than vertical. This sets the plant to grow out instead of up. When you use LST training, you will notice that once you have taped the plant down, the side branches will start to expand upwards and turn into main stalks. Make sure to tape these ones down as well until you run out of room at the base of the pot. At this point just let your plant grow. The author has had plants only grow to be a foot or two in length with this LST method. They will be very bushy and short which, depending on your grow area, could be exactly what you need. Super cropping is another way to prevent your plants from growing too tall or just to make them the same height as all your other plants. It consists of gently squeezing and twisting your stalks so that it doesn’t destroy them but makes them droop. Essentially what is happening is that the stalk is being crushed to the point that the rigidity of it is destroyed. Don’t worry though, the plant can continue to push nourishment through the channels even without the structure of the branch. The area where you have crushed and twisted the stem will eventually form a small hard ball as a result. It does not appear to damage the plant except for make it look kind of odd. Doing super cropping should be done well in advance of flowering. Once you start to flower, you will not want to be messing with the stalks. Topping Cannabis is a great way to increase yields by a lot. Without using this method on your plants, they will look like Christmas trees with one main cola on top and a bunch of smaller ones around it. With topping, you will get 5-6 main colas and your plant will be half the size. The author always uses this technique on every grow and you should to. Be sure to watch this video on topping as it is much better to see rather than read about it. There are other methods to cropping however the author has only used the above methods. Feel free to experiment with other methods and techniques that you might learn from other growers. The science of growing marijuana hasn’t been perfected yet and there is much room for all of us to learn. Confused on how to dry weed? At this point you will want to find a space that will be specifically dedicated to drying cannabis. The author finds a bathroom to be ideal as it is small and the humidity can be monitored at all times. It is in this space that you will be needing to hang your buds to dry. The whole process takes about a week and is fairly simple. There is something called a weed rack that can be purchased for about $50 online that can simplify the drying process but they aren’t necessary for smaller quantities. A simple drying rack can work just as well. It doesn’t really matter how you get them hung as long as they aren’t touching each other. The humidity in the room should also stay around 60-65%. You will most likely need a hygrometer to be checking these humidity levels. This is of utmost importance. It needs to be between 60-65% at all times. You want your weed to dry as slowly and safely as possible without creating mold. If you keep the humidity within these levels, you shouldn’t have any issues. Anything higher than 70% is asking for trouble. Because this is a guide for growing in Colorado, it’s important to know that the humidity here is almost always too low to correctly dry weed. It will dry too quickly unless a humidifier is purchased. Buy one that you can see the mist leaving the device. A cool or warm mist one would work well. Here are a few examples of good humidifiers proven to work. Don’t buy one that is too small if you are drying in a large room though. It just won’t be able to keep up. Another necessary product to dry cannabis is a very small fan. Using bigger fans will dry your buds out way too fast and ruin the taste. The type of fan that the author uses is as follows. It is also important to keep the lights off in the drying room and keep the temperature fairly cool. Room temperature or less is ideal. So, you’ve made your cuttings, trimmed them, and hung them. The rest of the process is waiting and monitoring. You will want to look at the buds each day and check for signs of molding. It will show up as little white furry spots. The author has never had a problem with this but it does occasionally happen to unsuspecting growers. If you do find mold it’s best to remove the affected buds and throw them away. If you have followed the directions in this guide, then you will avoid any issues by constantly checking your hygrometer and monitoring the drying room. Confused about how to properly cure weed? Curing is pretty easy and the most enjoyable part if you have followed directions thus far. At this stage you will also be able to smoke some of your weed as well. In fact, that’s what most growers and dispensaries do with their weed after drying. Rarely do they ever fully utilize the curing method as it takes too long. Make sure to pay attention to the following as this is what is going to make your marijuana smell and taste like kind bud. It has been overcomplicated from all the different techniques on the internet but we will make it simple and foolproof in this guide. The first thing to do is to make sure the buds are ready to be placed in jars. They must be dry enough though. There is a lot of literature around that will tell you to wait until you can break the small hanging twigs in two but this is NOT recommended. At that time the buds are way too dry for proper curing. The best way to know if your buds are ready for jars is to touch it. You don’t want to be rough, but squeeze the buds and if they feel hard and dry then it would be a good idea to see if they are ready. At this point, take one branch down and place it in a jar. Get a hygrometer and place it with the bud in the jar. Wait a few hours and see what the hygrometer says. If it’s 70% or below then your bud is ready to be jarred and cured. If it’s 70% or higher then you need to keep drying it for longer. Open up the jar and put the yield back in the drying room. This technique has been the best way for the author to accurately determine if the weed is ready to be jarred or not. Follow those instructions and you will have great weed to smoke later. If you don’t, then there will be too much humidity in the jars and you will get mold which makes the weed taste, smell, and smoke awful. So, at this point, you should be sure the weed is ready to be cured and are prepared with a lot of 100% sealable jars. These jars are needed for curing smaller quantities of marijuana bud. They are cheap and you will need them for every grow you have. They will be worth the small investment. Take some or all of the weed and cut the individual buds off the branches and collect them into the jars. Leave a little space at the top for a hygrometer to help you check humidity. Place one in as many jars as you have hygrometers for and wait a few hours and follow the subsequent steps. Again, if the hygrometer reads 70% or higher then you want to open the top of the jar and shake it and place it back in the drying room for another half day or so. On every grow the author has done, he has had to place a few jars back in the drying room to dry out more. It’s common. For the jars that are under 70% humidity, you are going to want to seal them up but burp them several times a day. Burping means taking the top off the jar, mixing the buds up so they don’t get stagnant and let it sit for 15 minutes in the open air. What you are doing during this burping process is taking the marijuana from 65-69% humidity to 55% over the course of a few weeks. Every time you take the top off the jar and let it sit, you are essentially releasing humidity from the buds. Once the 55% number is hit, your weed is 100% ready to smoke! Congratulations! You did it! At this point you are all done with vegging, flowering, trimming, drying, and curing. There is nothing more to do now besides plan for the next grow. 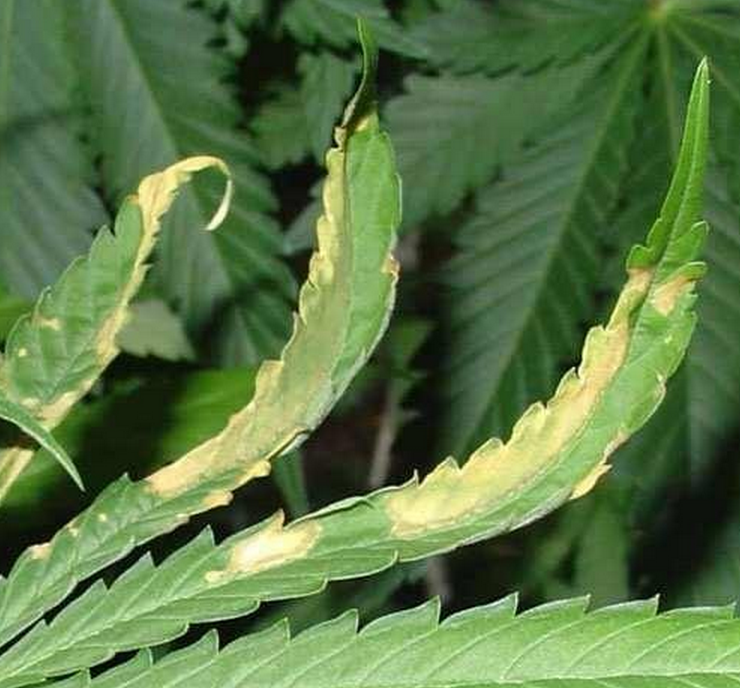 Nutrient burn can look like just about any problem when growing marijuana. It is easily noticed because the tips of the fan leaves turn yellow and brittle. If you are seeing anything but lush green leaves then you know you have an issue that needs attention. Now, a few fan leaves turning yellow or a few leaves dying on you is absolutely normal. We’re talking about the majority of the leaves showing signs of distress. The first thing to do if you see any of these red flags is to immediately stop supplementing your waterings with nutrients. Give them about a week with just water and you should see the lush green returning to the new fan leaves. The damaged leaves will never look the same and can be plucked when they eventually become dry and brittle. Now, if you have dosed entirely too much and your plant is in obvious distress, don’t panic. Get some more soil and transplant immediately, or flush the plant with a flushing agent. These agents are very easy to use and don’t require too much effort. Just follow the directions on the bottle for best success. What flushing does is help carry the excess nutrients out of the plants system. Watering heavily after the transplant is also essential to get the excess solvents out. Don’t make the same mistake you made in the first place after fixing a nutrient problem though. Cut your nutrient feed by half and see how that goes. As stated earlier, never use the full amount of nutrients contained on the label on your bottle when using nutrients. The author recommends using half of what the bottles directions say. This is a super common problem and will manifest itself in the form of drooping leaves. Overwatering is very easy to do and just as easy to cure. Stop watering for a few days until you notice the leaves perking back up. If your plant is in obvious distress over the over watering, then a simple fix is to transplant into fresh new dry soil. Monitor the plant for a few days after doing this to make sure it doesn’t overly dry out though. You should water your marijuana plants often but only if they need it. You can tell if they need water if the first couple of inches of dirt is bone dry. The author ends up needing to water his plants about once every other day depending on a number of variables. This is also a pretty easy problem to have when growing cannabis. It manifests itself by drooping leaves as well. You will know if it’s under watering opposed to over watering because the soil will be dry and crumbly. If it’s wet and the leaves are droopy, then you know it’s probably over watering. Make sense? The solution to this problem is to give your starving plant some water! Water is one of the main key ingredients that the plant absolutely needs. If you are stingy on this, then your plants won’t grow to their true potential and your yields will suffer. 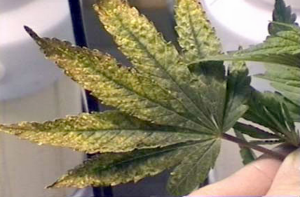 Also, if you are using nutrients and under watering, it is very easy to burn the leaves so be careful. You know you have light burn if your leaves start to curl upwards and turn crispy. Take your hand and place it where the leaves are curling upwards and see if it’s too hot after 30 seconds. The solution to this problem is easy, just raise your light or purchase a less intense fixture if raising it isn’t an option. Light burn can also be caused by a bad bulb. Make sure when you purchase your bulb, that it hasn’t been used too often. Bulbs, at least 1000W HPS, should last you two grows and that’s about it. After this, get yourself some new ones. Root rot is normally seen in hydroponic systems as a result of them being grown in water 24/7 but it can happen in soil systems if you are consistently watering too much. You will see the first signs of root rot by wilting leaves and perhaps what looks like nutrient burn. Your fan leaves will also start dying if the situation isn’t rectified. Root rot needs bacteria and a wet environment to grow. To combat this problem, stop watering for a few days and let the soil dry out or transplant into a new grow medium. Fresh dry soil should help the situation out. Root rot can be dangerous because it looks like overwatering or under watering when in actuality, your plant’s roots are turning brown and dying. It is also pretty common if you are using a very small container and your plant is too big for it. You would be surprised how elaborate and large the root structure is within your plants, especially during flowering. The roots grow to be just as big as the plant. If it’s in a large enough pot, the roots will just curl around the edges of the pot. If it’s in a small pot, then the roots tend to have nowhere to go and root rot can occur. 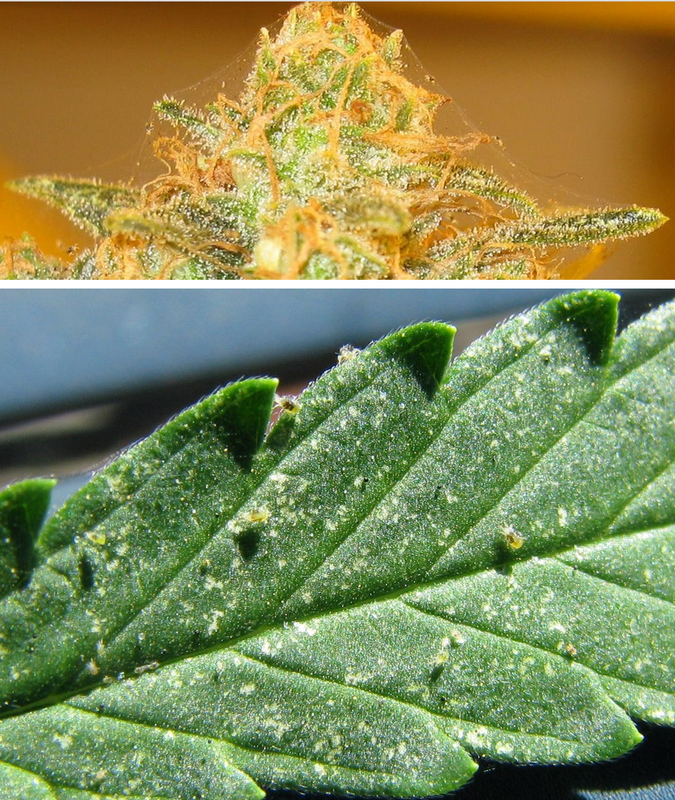 There are a bunch of parasites that affect marijuana plants. Normally, you don’t just get parasites by yourself. Instead, they come from interacting with other growers or where you got your clones from. Not everyone is careful with their plants and practices good growing techniques. So just be careful where you get your supplies. Check all your new clones before buying them for anything abnormal looking. 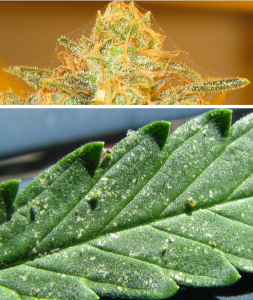 Little spider mite webs, little holes in your leaves, and other abnormalities are red flags! If any leaves look remotely close to a parasite infestation, then do not take it home! Prevention is way better in this case than the eradication of parasites. There are too many parasites to list here in this simple guide but some of the more common ones are spider mites and fungus gnats. It’s best to avoid purchasing clones or plants already affected by parasites but it can happen no matter how careful you are. The solution to eradicating all the different types of parasites is beyond the scope of this manual. All over the internet can be found great techniques to eliminate particular parasites from your crop. It has been the author’s experience that the best way to get rid of problems with your grow is with neem oil. This is the best product to use during the vegging stage. If you are in the flowering stage and buds are growing, you don’t want to use it. Instead, there are a number of home remedies found all over the internet that can help you out. Below are some other common solutions to pests in your grow. Okay, after listing some things that can go wrong with your plant, you’re probably wondering how anyone can grow normal marijuana plants. If something goes wrong, or at least looks wrong, it might be normal after all. It is extraordinarily common for some leaves to come out twisted, some to turn yellow, some to have spots on them, etc. It becomes an issue however when the majority of the leaves are twisted, falling off, or turning yellow. You can still have great plants even with a few misguided fan leaves. Marijuana is a weed and will grow in pretty much any environment. There are many other cannabis deficiencies out there and this marijuana guide doesn’t contain them all. If after reading this section, you still don’t have your answers, do a Google search for further advice. Well, this is a sticky subject isn’t it? Can you sell your marijuana in the great state of Colorado? Technically you can’t sell it unless you are a dispensary. But if you deliver an eighth of an ounce to a friend and he gives you $35, is he paying for the marijuana or the act of delivery to his house? That is a question that will for sure be settled in a Colorado court within the next few years. Right now there are hundreds of people offering “Delivery” services for marijuana on Craigslist. Many of them are home growers like you, and many are commercial growers with pounds of extra yield for sale. If you do decide to risk it and go this route then make sure to respect the laws of other states. 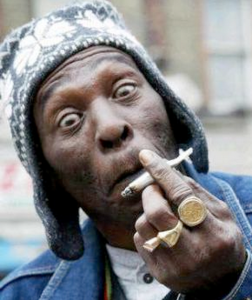 Not everyone believes that marijuana is helpful or even worth having on this planet. Many states will lock you in prison for years for transporting or shipping marijuana across state lines. Well, this is the least cost effective method but you can freely give your marijuana away to basically anyone over the age of 21 as long as it’s an ounce or less if they are non red card holders and 2 ounces to any medical patient. Duh! One of the best ways is to use a dry herb vaporizer! You can very easily make your extra marijuana into cookies, concentrates, hash, shatter, or wax. If you decide to go this route then make sure to use the extra trim you have as well. This is a valuable source of THC. 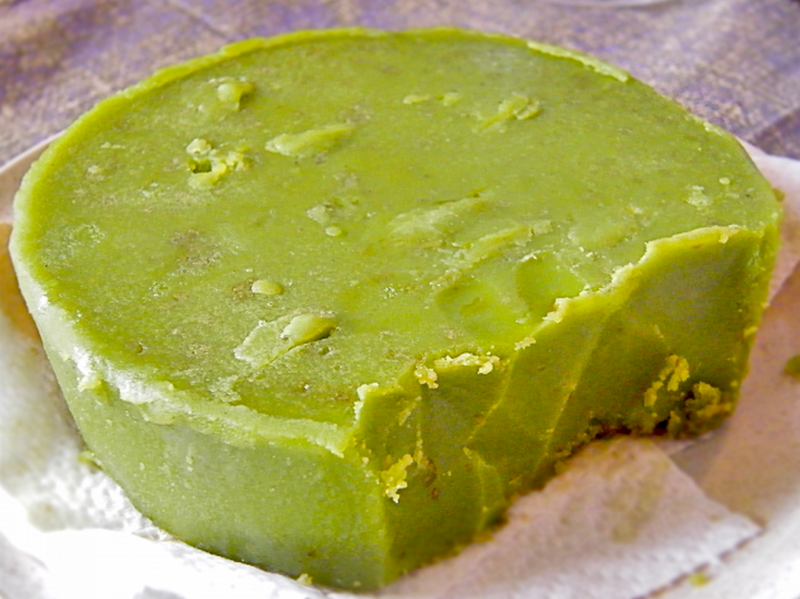 As to how to make edibles or concentrates, that is beyond the scope of this guide and will have to be covered in future releases. What To Do With Fan Leaves? You really can’t do anything with the fan leaves per say. 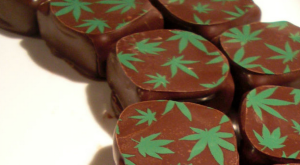 They don’t contain enough THC to smoke and thus edibles or concentrates are out of the question as well. So why did I have you put them in a bag and into your freezer? Some people out there do something called marijuana juicing. This is not ordinary juicing, it’s actually juicing the fan leaves for important chemicals and nutrients that help some with diseases such as lupus and multiple sclerosis. You can find someone looking for fan leaves on Craigslist. Just throw up an ad and mention that you have extra fan leaves for those juicers out there. The author just donates them to a gentleman named Chris who uses them as frequently as he can to alleviate his pain from multiple sclerosis. He will even come to your grow room and pick them up for you. If you are interested, his email address is energy4you100@gmail.com. It’s 100% legal to do this so don’t worry. Just pay attention to how much you give away as the same “Ounce” rules apply to fan leaves. The author feels that since they are of no value to most people, that they should be given away for free to those that are looking for an alternative to high powered pharmaceuticals. Just his opinion though. We would love your feedback! A lot of time was spent working to eliminate unnecessary steps and costs associated with growing marijuana. Some of them are controversial and others aren’t but the author has had extraordinary success using only the methods shown in this guide. If you are in another state and wish to grow marijuana, we strongly urge you to either become a red card holder or be very careful. If you’re growing in a non-legal state, you need to assume all risks and liabilities. Thank you and let’s keep the Cannabis movement growing and prospering. The legalization of marijuana in Colorado is just a small step towards the legalization of all helpful drugs. Imagine what could be done if all the money being spent to eradicate drugs were to be spent on rehabilitation centers, research into potential cures from these never before researched drugs. It is our hope that you can join to help dispel the negativity towards marijuana and other helpful drugs. Happy Growing! Check this out for other great resources. All of the above are recreational marijuana states. For any confidential questions or concerns, please email DenverPartyRide@gmail.com for a prompt and secure reply.